“You won’t leave me?” I asked at last. “You won’t die?”He shook his head, and squeezed my hand tight.“You are my courage, as I am your con­science,” he whis­pered. “You are my heart—and I your com­pas­sion. We are nei­ther of us whole, alone. 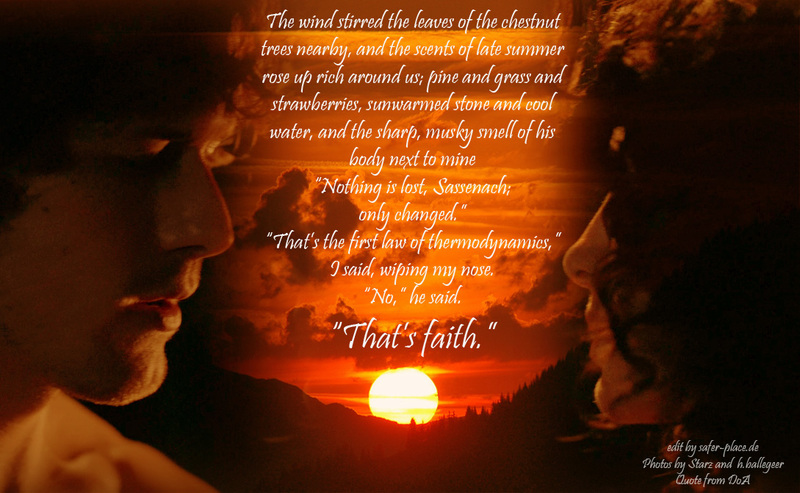 Do ye not know that, Sassenach?”“I do know that,” I said, and my voice shook. “That’s why I’m so afraid. I don’t want to be half a per­son again, I can’t bear it.”He thumbed a lock of hair off my wet cheek, and pulled me into his arms, so close that I could feel the rise and fall of his chest as he breathed. He was so sol­id, so alive, rud­dy hair curl­ing gold against bare skin. And yet I had held him so before—and lost him. Love­ly as always! Any­way to pin the quote about faith and The Law of Ther­mo­dy­nam­ics? I have tried , but I can only pin the quote in the mid­dle. I look for­ward to With­out­lander everyday.I wish that I had pinned them from the begin­ning! Thank you for all the beau­ti­ful ideas! The pic­tures of Jamie and Claire may belong to Starz and the mag­nif­i­cent words belong to Diana Gabal­don but the rest of this beau­ty is how you put it all togeth­er. It breaks my heart in a good way but still breaks my heart. Heike, thank you. This pas­sage is so impor­tant and beau­ti­ful it makes me to tears. Girl you always do so right­eous work. Love y’all. I real­ly liked your blog, Heike. You always bring the essence of Out­lander to the fore­front. 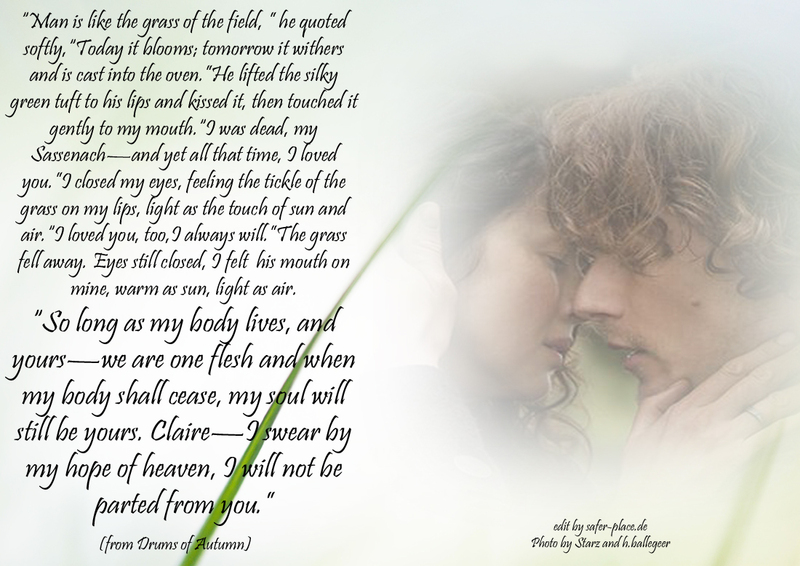 The deep rela­tion­ship between Claire & Jamie are so para­mount to the sto­ry. Thank you for shar­ing.